Beautify CNMI! : Looking for Some Lovin? Well, Adopt Me!! Is your family lacking evening entertainment? Do you wish you had a warm, soft body to happily greet you at the end of the day? Well, PAWS has exactly what you are looking for! PAWS is currently trying to find homes for EIGHT kittens. If you or someone you know is interested in adopting one or two kittens, please contact the rescuers below. Two kittens, one male and one female, are up for adoption to loving homes. They are about 10 weeks old. Both have been examined by Dr. Tudor and de-wormed. 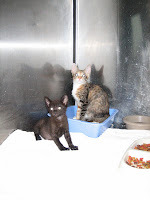 They are scheduled to receive their vaccination shot on the 14th, compliments of PAWS. These two are keepers. They are good with dogs and cats, and they absolutely love people. 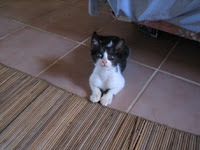 They would make a great pet for someone who is looking for one or two house companions. If you are interested in adopting one or both of these kittens, please contact Katie at busenkell@gmail.com or at 256-0243. This is the little lady. She has a GREAT personality: she's funny, busy, playful, smart, and loving. This is "PigPen." He is always a little dirty, and strangely, that makes him more irresistible. He LOVES to he held, and will actually ask to be picked up. He is a lover. 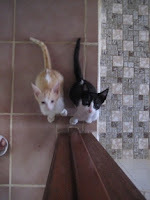 These two kittens were brought into PIAH and never picked up. 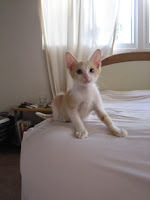 Naturally, Dr. Tudor is taking great care of them and desperately is looking for a loving and responsible home. The Calico is about 10 weeks old and a female. She has an absolutely beautiful face. The black one is about 8 weeks old and is a male. Some people are afraid of black cats, and I'm telling your right now that all those rumors ARE ABSOLUTELY NOT TRUE! My two cats growing up were black, one of which is still alive and healthy at 22 years old, and I can't tell you how much joy they brought to our family. Both kittens have been de-wormed and are healthy. They love all the other animals at the hospital, which says a lot about their personalities, and they particularly like people. 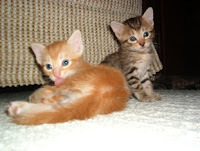 If you or someone you know is interested in adopting these two kittens, please contact PIAH at 234-9669. God made kittens this cute so we could find a home early in life. Look at those faces! Wes has four healthy young kittens that are almost ready for adoption. They just started to purr this week, so they are not quite ready to leave mom yet. However, you can still lay-claim to one of these little guys by calling Wes at wes.horlings@gmail.com and 287-2467.